The registration will open at October 10, 2019.The race is fully subscribed when 180 participants have registered. The deadline for registration is May 31, 2019. If you can´t participate and want to sell your spot, you can allways sell it on the private market. Any change of name is made via a link to the receipt that is sent out upon registration, but no later than May 31, 2019. The registration fee is SEK 800 and it is then included bus transport on Friday at 6.30PM from Örnsköldsvik to the start at the High Coast Bridge. Please mark if bus is wanted or not in the registration form. It also includes service during the race, transport to the finish if you have to drop the race, our finisher shirt, food and drink at the finish and honorary awards to the main in each class. No cancellation can be made, but we refer to the private market for sales. Change of name is made by the person who is registered via a link on the receipt, however by 31 May 2019 at the latest. Starting envelopes will be handed out between 5am and 6pm (17.00 – 18.00) at the parking lot below Paradiset where the buses to the start also depart. For those of you who will go straight to the start, starting envelopes will be handed out from about 7pm (19.00) in the designated room at the High Coast Hotel. The buses to the start goes from the parking lot below Paradiset at 6pm (18.30) for those who signed up, see directions. We ask you to be in time to the bus as it is important that the bus goes on time. The bag you want to have at the finish is left before boarding the bus, bring the outher drop bags with you on the bus to the start. If someone has further needs for transport to start, please contact us as soon as possible. If delay for any reason arises and you do not have time to get to the bus, please contact competition management at +46722151388. We want to know who is going with the bus so we don’t miss anyone. Runners will be able to send two dropbags to any food and control station in Skule, Näske or Sandlågan – and one bag to the finish at Varvsberget. Those of you who go by bus from Örnsköldsvik to the start leave the bag to the finish before boarding the bus. A race briefing in Swedish will takes place at 8pm (20.00) in one of the hotel premises, containing safety, rules and regulations. If you want an English version please contact the race manager after the briefing. The start will take place on Friday, June 7 at. 9pm (21.00) at the playground behind the Höga Kusten Hotel. 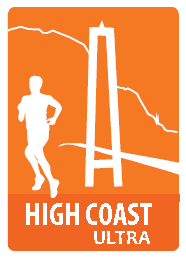 The race will go along the High Coast Trail. The substrate varies from asphalt to extremely technical stone and root paths. The trail is marked with orange markings and blue-white signs. The organizer has improved markings on certain points, with own signs, to minimize the risk of getting lost. For people with red / green color blindness, the orange markings can be difficult to see. Before the finish where the last 5k will follow a well marked path. Read also the Rules and regulations for the race. We use manual timing during the race. At the food and control stations there will be an intermediate result that will be published live. There are simpler first aid materials as well as first-aid-trained crew at every food and control station and at the finish. Food and control stations are located at Mädan 38K, Skule 75K, Näske 96K and Sandlågan 112K. At each station there are water, Tailwind (sport drink with lemon taste), coffee, Coke, vegetable broth, bananas, salted cucumber, something salty (chips/nuts), something sweet (candy/ chocolate), buns or other sweet bread. Vegetarian options are available at every station. Skule Naturum : Hot dogs with bread and mashed potatoes, shrimp salad, mustard and ketchup. Warm blueberry soup. At this station there are also toilets and showers available. There is also a rest room where runners can rest on a hard surface. Toilets are available. The finish at Varvsberget, Örnsköldsvik: Tailwind sport drink, chips, sodas and light beer. Food in the form of a wrap (also a gluten free, lactose free and vegetarian option). Water containers are placed at approximately every 10k for filling up bottles and camel backs, see the race-PM for exact locations. Please be aware that there are only water at these stations and that there are no cups. The maximum time is 26 hours and we also applie cut off times at the food and control stations. Please read our rules and regulations or our race PM fore detailed info. Support from own support team or outher persons may only be done in direct connection with food and control stations. It is therefore not allowed to receive assistance at the track or at the water stations provided by the organizer. It is allowed to run with pacers after passing the food and control station in Sandlågan 112k. Pacers must follow the same rules that´s applyed to the runners. Pacers must not carry food and drink for the runners and are not allowed to help the runner in any other way, for example by pulling the runner with the aid of a rubber band . The result is published live during the race. Final results are then presented on the website. All runners who complete the race receive a finisher t-shirt sent home. Prizes will be given to the top three in each class. Dressing room and shower are located at the FriskaViljor cottage next to the finish line. Dropbags are transported there by the organizer and will be delivered at the latest in the evening 8 PM (20.00).